When Amplid Cartel team rider McRae Williams’ busy calendar of Dew Tour stops, photo shoots and contest invites like the John Olson Invitational aren’t dragging him across the globe like a wandering nomad, McRae likes to head to his local resort Canyons, Utah. Situated a mere four miles from down town Park City and only 30 miles from Salt Lake City International airport, Canyons is the largest ski and snowboard resort in Utah and one of the biggest in North America. Canyons is famous for the huge diversity of terrain on offer (4,000 acres), a ridiculous average annual snowfall of 355 inches, a mile long terrain park and almost 1000m of vertical drop. Amplid caught-up with McRae to get the low down on his local resort and find out a few insider tips. What is your local resort? I live in Park City, Utah where we are blessed with not one, but three amazing resorts. These resorts include Deer Valley, Park City Mountain Resort, and Canyons, which is where I spend most of my time. How long have you been riding there? Since I was 3 years old. Why does the resort hold a special place in your heart? Skiing has literally taken over my life, and Canyons is where it all started. I learned everything I know there from pizza on the bunny hill to sending cliffs on 9990, and hucking rodeos in the park. How many days a year to you ride at Canyons? Not nearly as many as I’d like unfortunately, because I am always traveling I do not get as many days skiing at my home resort as I used to, but I take advantage of every chance I get. When does the season run from – to? From about mid-November to mid-April. Conditions permitting of course. Considering the past couple seasons, I would say March. It has been a little dry up until then, but it has seemed to get dumped on come March. There is also a smaller crowd, and the snowpack has had some time to build up. What is so special about the resort? The special thing about Canyons is that they have it all. Everything you could ever want from an amazing mile long terrain park to epic backcountry access. With over 4000 acres in skiable terrain they are Utah’s largest resort. They also have really good food including my favorite, a waffle haus! Nothing like a delicious caramelized waffle break. Yum! Tell us about the park? Who runs it? What features/obstacles are there? What are your favourite features? Is it well maintained? Canyons’ Transitions terrain park is truly something else and is run by none other than Steve Duke. 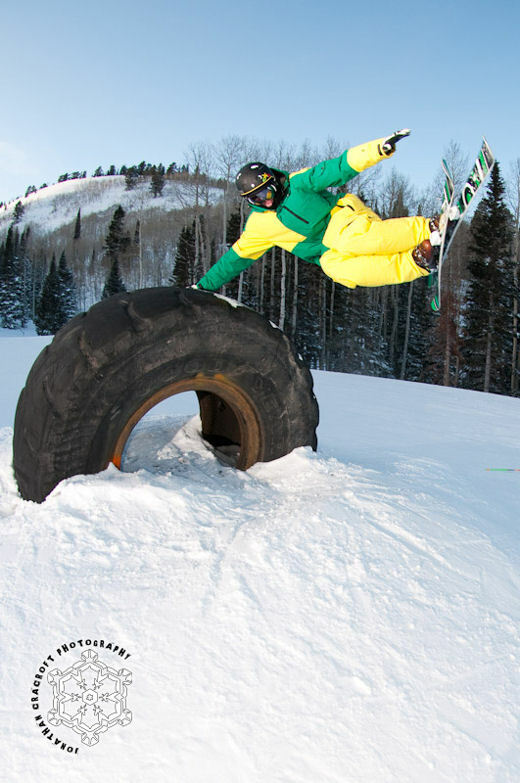 It is 1.1 miles long deeming it the longest terrain park in Utah, and has over 50 features. They have some of the most creative stuff I have ever seen including a huge corrugated shipping container set up as a wallride, and even a car you can jib! Indeed. There are thousands of acres of backcountry terrain that can easily be accessed from Canyons’ many backcountry gates. One specific spot that we refer to as the big O stands above all others. It is a perfect pitch run with nicely gladded pines interrupted by a massive cliff band about a quarter of the way down. The cliff band appears as a huge horizontal oval when viewed from below, hence the name the big O. What is the local scene like? Lots of park rats? Serious freeride scene? The local scene at Canyons is really quite varied. We got everything from Gangster park rats to crunchy backcountry dudes. Are there any good events, competitions or parties that happen in the resorts? Certainly. 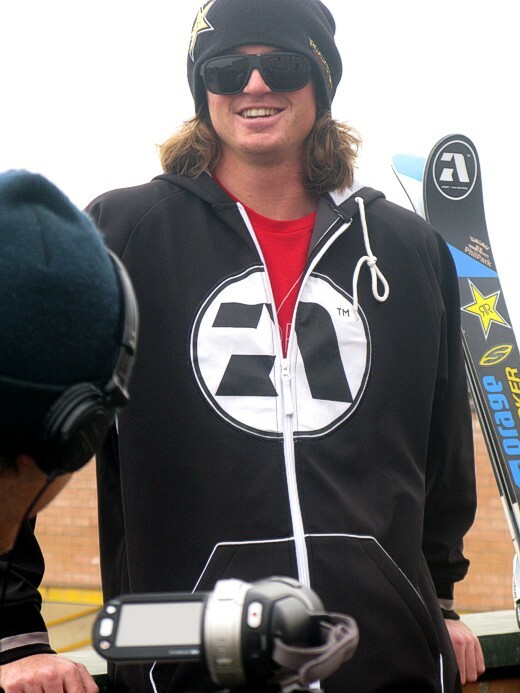 There are slopestyle competitions, boarder cross competitions, easter egg hunts, and even pond skimming. My personal favorite would have to be the canis lupis challenge, which is a race from top to bottom of Canyons’ longest and gnarliest natural halfpipe. You don’t want to miss this one. Also, there is a series of concerts and events every spring called the Spring Gruv. Any good nightclubs, bars, pubs or restaurants that peeps should check out? If you are looking to check out the nightlife or grab a good bite to eat, definitely head to Main Street. Main Street has it all. A few local favorites are Oshucks, Sidecar, Downstairs, and Davanzas for pizza! What are the local girls like? The local girls love to party and have a good time on the mountain, so get up to Main and find yourself a dance/shred partner! Are there any local Amplid dealers?